Longtime collaborators on the Image Comics/Top Cow series ARTIFACTS, Ron Marz and Stjepan Sejic have taken their creative partnership to a new level - a creator-owned graphic novel series, RAVINE, starting in February 2013. 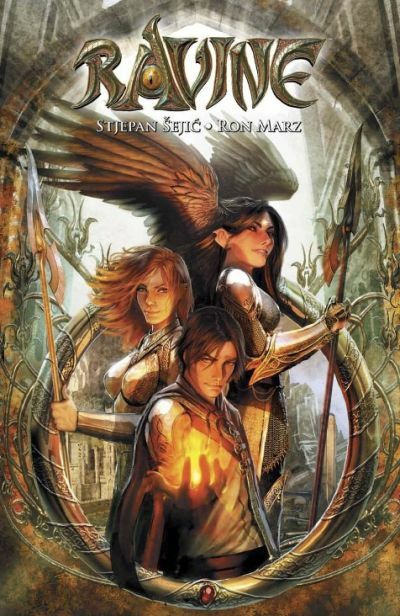 Epic fantasy at its highest with dragons, magic, and political machinations, is set in the kingdom of Palladia, a world that Sejic has been developing for the past eleven years. ”Ravine originated from my desire to make a fantasy comic series that was a full-blooded fantasy tale with rich character development, layered, well-motivated villains, and a deeply detailed world,” said Sejic in a December 20 interview with Comic Book Resources. The world is one where intrigue and power struggles have so dominated the lives of those who rule - royalty and religious leaders alike - that they are blind to the gathering forces that threaten all of them. While the story, world, and characters are Sejic’s, Marz acts as scripter and editor. Both creators cite the nature of an epic fantasy as the reason for releasing the series as graphic novels rather than individual issues. RAVINE: VOLUME ONE (DEC120509), a 160-page graphic novel for $14.99, will be released on February 13.